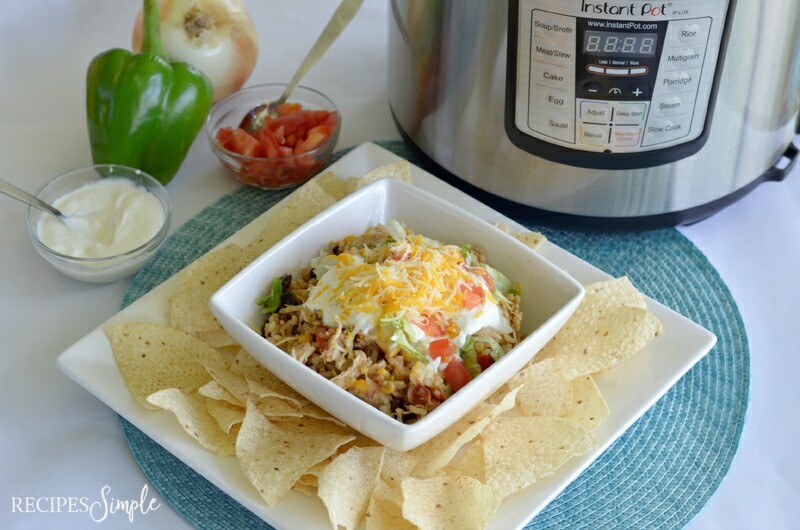 Easy all-in-one dinner Instant Pot Chicken Burrito Bowls have all your favorite ingredients found in a burrito but served in a delicious burrito bowl where you can add all your favorite toppings. You can top with lettuce, cheese, sour cream, avocado or guacamole, black olives, and tomatoes for a easy family friendly dinner. 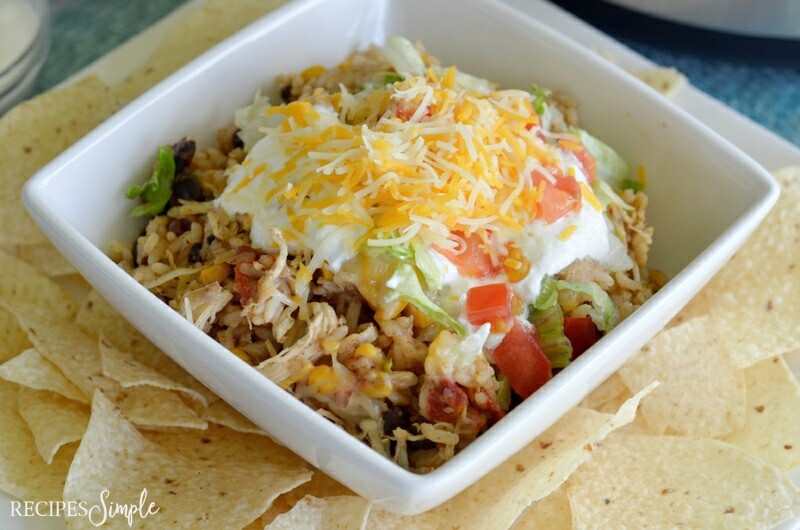 These Instant Pot Shredded Chicken Burrito Bowls are one of my favorite go to meals when I’m short on time. There are lots of different ways you can serve this chicken burrito filling. You could make actual burritos with this chicken burrito filling. 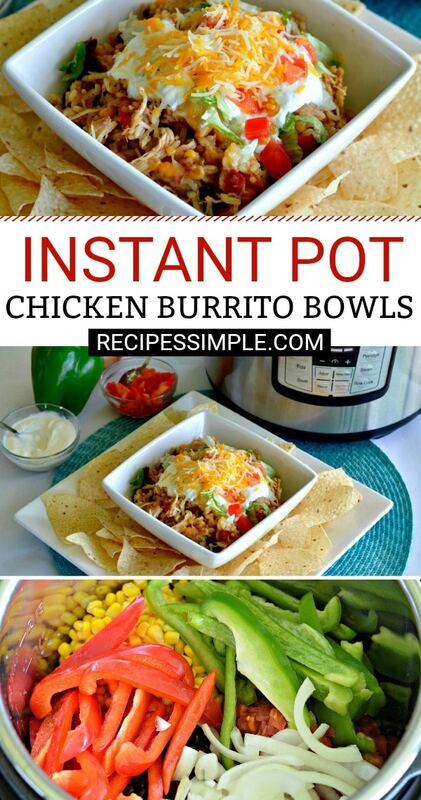 Just add it to a tortilla with your toppings and roll it up and eat it as a burrito. It would also be great served in tacos, enchiladas, quesadillas, or nachos. 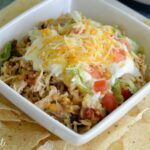 Scroll to bottom for printable Instant Pot Shredded Chicken Burrito Bowls recipe. In the Instant Pot, pour just enough chicken broth to cover the bottom of the pot. Then place the chicken breasts along the bottom of the pot. Pour the corn, black beans, and Rotel into the pot. Add both the green and red bell peppers, and the onion. Add the rice evenly to the pot. Then add the remaining chicken broth. Try to push the rice down so that it’s covered by the broth. Using your Instant Pot’s instructions, pressure cook for 10 minutes. Allow it to slowly depressurize for 10 minutes. Then release the sealing valve to vent any remaining pressure. Remove the lid. Using 2 forks pull the chicken meat apart so it becomes thin enough for a good taco consistency. Stir well to incorporate all the ingredients and place the lid back on. Do not turn the Instant Pot on, but let it sit with the lid sealed for at least 5 minutes. This will finish cooking any rice that may have been sitting on the top and not cooked all the way through. Pour the corn, black beans, and Rotel into the pot. Try to pour them in different sections of the pot, so everything doesn't pile up in one place. Add both the green and red bell peppers, and the onion. Again, spreading them evenly along the top, so they don't pile up too much. Add the rice evenly to the pot. Then add the remaining chicken broth. Try to push the rice down so that it's covered by the broth. Using your Instant Pot's instructions, pressure cook for 10 minutes. Once it's done cooking, allow it to slowly depressurize for 10 minutes. Then release the sealing valve to vent any remaining pressure. Remove the lid. Using 2 forks pull the chicken meat apart so it becomes thin enough for a good taco consistency. Enjoy in a bowl by itself, in a soft tortilla, or with tortilla chips. And don't forget your favorite toppings! Can you use minute rice? It is long grain??? It can’t be instant rice. Look for the bags of long grain rice. They are usually on same aisle as Minute Rice. Hope you enjoy it! What about frozen chicken breast would I need to adjust the cook time? Yes, I would follow the recommendations of your Instant Pot manual for cooking chicken that is frozen. Hi Tanya! I have not tried freezing the leftovers so I’m not sure how the rice in the recipe would do when thawed and reheated. I make a similar recipe with ground turkey, rice, etc that I have made and froze several times. I’m sure it’ll be fine!! Judy, I can’t wait to try this recipe!! I think I’ll make it tonight!! Thanks Jessica! I hope you enjoy it!! I did make it tonight!! It was delicious! Thank you for the recipe. How about long grain brown rice. Would I increase the cooking time? 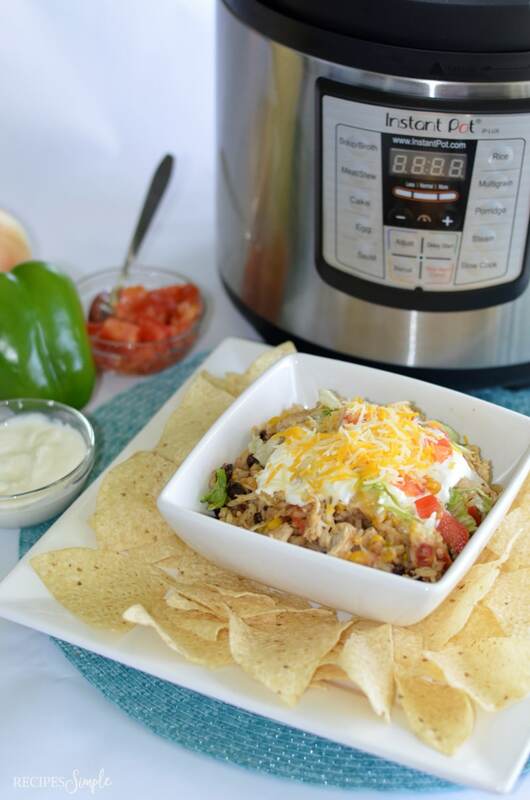 I haven’t tried it with long grain brown rice but I would look at your Instant Pot guide for differences in cooking time for different types of rice. You could double the recipe but I have not tried it to see how it would do. I just doubled it in my 6 quart, worked well but the pot was really full so I had to transfer everything to a bigger pot to shred the chicken. I did manual 13 minutes, 13 minutes NPR. Rice was cooked well, without having to put the lid back on as stated in the recipe. Next time I will definitely add fresh cilantro. Fresh cilantro would be a good addition to this dish! It’s one of those meals where you can add in or take out what you don’t like. I love those! Could I use quinoa instead of long grain rice? Same time? Thanks! I haven’t tried it or tested it with quinoa so I’m not sure what the adjustment to cook time would need to be. 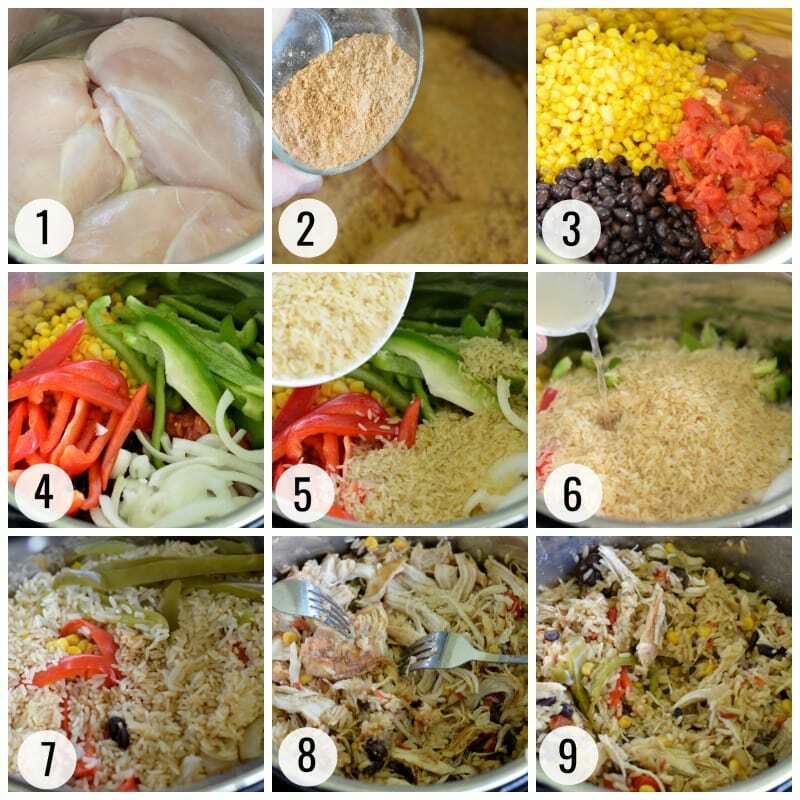 Could I pour the rice over the chicken, then layer the rest of the ingredients and broth to avoid the last step of replacing the lid for 5 mins? Hi Beth! I haven’t tried it that way but I think it should work. If you try it please let us know how it turns out. This is a great recipe! I made it in an 8qt IP with five chicken breasts on the bottom instead of three. Otherwise I followed the recipe exactly and it was delicious! We had ours in tortillas with sour cream, salsa, cheese and lettuce. Will definitely make it again! This was so easy and so yummy! I do Weight Watchers so I really appreciate how point friendly this meal is! Thank you! So glad you enjoyed it. It’s a favorite at our house! I don’t have rice 8 the cupboard but I have cauliflower rice in the freezer. So I’m thinking of trying this with 1 cup of broth and the cauliflower rice. Has anyone else tried cauliflower rice? I haven’t tried it with Cauliflower rice but that does sound really good. Let us know how it turns out if you try it! This would be on high pressure. Hope you enjoy it! Do you think this can be done in the crock pot? I think I would not cook the rice in there, but what about putting all the ingredients in at ionce? Yes I think you could easily make this in the crock pot. I would cook the rice separately. Can I make this with brown rice instead and would I have to add more time? Hi Lisa. I haven’t tried it or tested it with brown rice so I’m not sure what the adjustment to cook time would need to be. Made this recipe for a Sunday night dinner with friends and everyone really liked it. I did make a mistake of buying “instant” brown rice. So, I just made the rice separately on the stove top and then added the rice to the rest of the ingredients in the Instant Pot and it turned out great. Hi Amy. I’m so glad you enjoyed it! My husband and I really enjoyed this recipe! Does one add rice that’s cooked or uncooked? The recipe doesn’t say. It’s uncooked rice. Hope you enjoy it! Delicious! Family hit! This recipe will now be a regular in my routine. So glad everyone loved it! It’s a favorite recipe at our house! 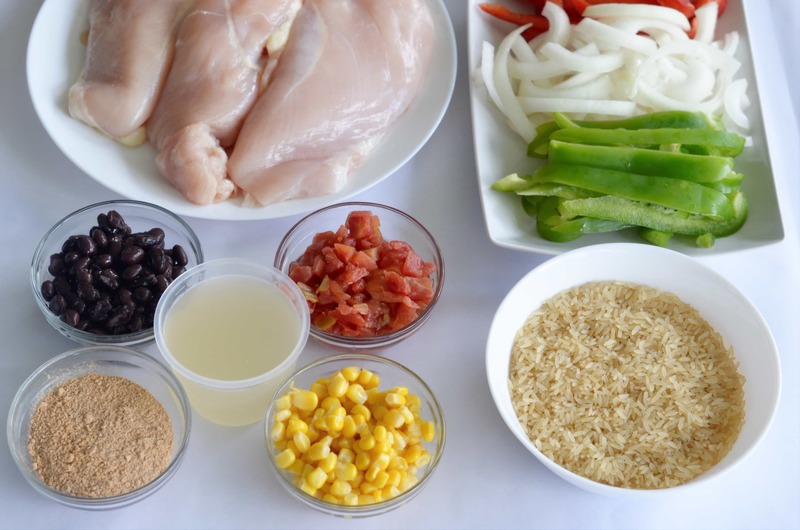 Can I use skinless boneless chicken thighs instead of breasts? Hi Tristin! I’m think you could use skinless boneless chicken thighs in place of the chicken breasts. I have not tried it that way so I can’t say if or how you would need to adjust the cooking time.